CERTIFIED LOW MILEAGE LUXURY CAR -- NAVI -- SUNROOF -- CLEAN TITLE! 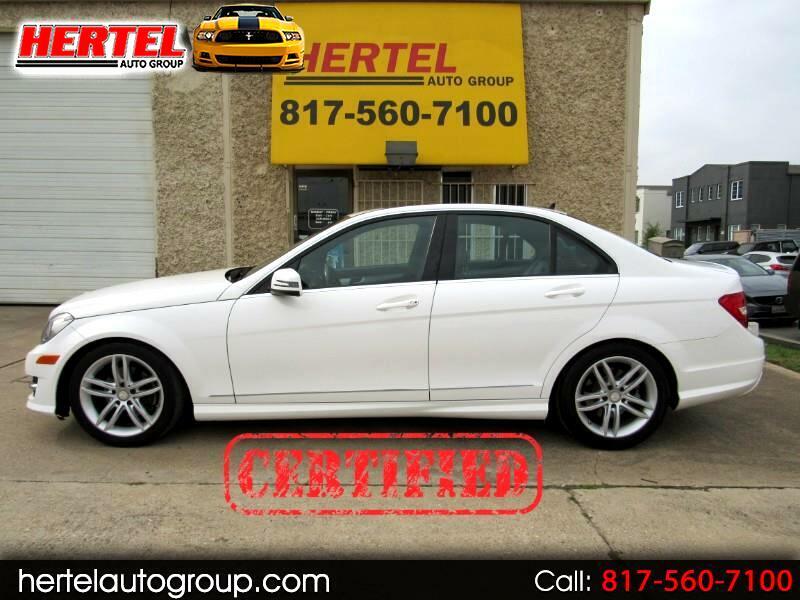 Hertel Auto Group is pleased to offer this exceptionally nice and clean 2012 Mercedes Benz C250 Luxury Premium Sedan for sale in Fort Worth Texas. If you've been shopping for newer model European Luxury Sedan that won't break the bank, then this is the one for you. Priced like an econobox, but with the prestige of a Bavarian Boulevard Cruiser, this is a very nice car! With so many mid-sized sedans like the Audi A4, Nissan Maxima, Infiniti G35 and the Lexus ES 350 chasing down the revered BMW 3 Series sedans with claims of increased sportiness and improved lap times around some racetrack, the Mercedes stands confidently on its own without having to give up ride comfort and general dynamic qualities indicative of the brand. For the 2012 model year, it had even more reason to express such confidence with a new design that boasted more curvaceous headlights and better integrated LED running lights. Its luxury interior also benefited from higher-quality materials, improved ergonomics & a design that felt much more modern, and a fixed display screen in lieu of the antiquated pop-up design found in the previous C-Class generation. Also improved were fuel economy and performance from the entry-level model with the introduction of a turbocharged 1.8-Liter 4-cylinder engine. With original factory specifications of 201 Horsepower and 229 lb ft of torque, this luxury sedan can sprint from 0-60 in around 7 seconds while still returning up to 31 mpg on the highway. Mechanically, it starts, runs and drives exactly like you'd expect it to. For additional peace-of-mind, this one is Hertel Certified which means it includes an outstanding 90-Day or 4,500 Mile Warranty that covers far more than just the motor and transmission. All four tires are in 245/45R17 tires mounted on OEM 17" Alloy Wheels are in good condition. For the safety conscious, this C-Class doesn't disappoint either. The C250 came standard with stability & traction control; anti-lock brakes; a driver's side knee airbag; front-side thorax airbags; front pelvic airbags; and full-length curtain airbags. It also includes Mercedes' outstanding Attention Assist which monitors the driver for signs of drowsiness and inattention. If you're a parent seeking a very safe car for you new driver, this one would be an outstanding choice. On the outside, this gorgeous C-Class Mercedes boasts an easy-to-care-for Arctic White Paint Scheme that is complimented by a Black Leather interior. Of note is the CARFAX Report which does show this C250 was involved in a very minor accident way back in March of 2014. No airbags were deployed, there was no structural damage and the car maintains a completely clean 'Blule' Texas title. Inside, the smoke-free interior of this Benz is nicely equipped with OEM Navigation; Backup Camera; a Power Sunroof; Bluetooth; Dual-Zone Automatic Climate Control; 8-Way Power Front Seats with Adjustable Lumbar; Tilt & Telescopic Steering; AUX Port; USB Port; Steering Wheel Controls; Power Windows, Locks & Mirrors; Cruise Control; Keyless Entry; CD Audio; A/C and more. As with any pre-owned vehicle, it does have the usual amount of cosmetic imperfections that are inherent to a vehicle of this age and mileage. We invite you to view all of the photos that are available on our Web Site and determine for yourself if it meets your expectations for a vehicle of this age and price. If it does, we then welcome you to stop by for a viewing and test-drive of this gorgeous 2013 Mercedes Benz C-Class C250 Premium Luxury Sports Sedan. Given its $39K+ original MSRP, condition, equipment and ownership history, we've priced it below all of the current market values and expect it to sell quickly. Don't let it pass you by! Certified Plus Coverage includes major components of the Engine and Transmission, as well as A/C Compressor; A/C Condenser; A/C Evaporator; Radiator; Water Pump; Thermostat; Alternator; Starter Motor; Power Steering Pump; and more. Service Work can be done at any Mercedes Dealership or ASE-Certified Mechanic. See Dealer for More Details & Upgraded Coverage Options!